This article is about the lake. For the local government area, see City of Lake Macquarie. Lake Macquarie or Awaba is Australia's largest coastal salt water lagoon. 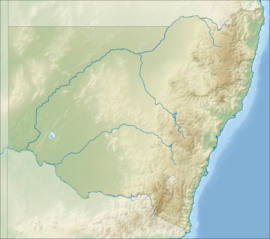 Located in the Hunter Region of New South Wales, it covers an area of 110 square kilometres (42.5 sq mi) and is connected to the Tasman Sea by a short channel. Most of the residents of the City of Lake Macquarie live near the shores of the lake. Lake Macquarie is twice as large as Sydney Harbour and is one of the largest salt water lagoons in the Southern Hemisphere. It is slightly smaller than Port Stephens, which is about 43 kilometres (27 mi) to the northeast of the lake. Aboriginal people of the Awabakal nation lived in the area surrounding what is now known as Lake Macquarie for thousands of years. The name Awaba, which means "a plain surface" was used to describe the lake. Lake Macquarie was first encountered by Europeans in 1800, when Captain William Reid was sent from Sydney to retrieve a load of coal from Newcastle Harbour. Reid took a wrong turn and found himself in a lake rather than a river, with no coal to be seen anywhere. The name "Reid's Mistake" was retained until 1826, when it was renamed in honour of Governor Lachlan Macquarie. The lake is of irregular shape and the land separating it from the ocean is only a few kilometres wide along most of its length. While there are a several small, sandy, low-level islets in the lake, some of which are grouped near the mouth, Pulbah Island, located south of Swansea is a large island offering views from rocky cliffs. Lake Macquarie is connected to the sea by two channels, Swansea Channel and Lake Entrance. Swansea Channel is approximately 380 metres (1,247 ft) wide and 2 kilometres (1.2 mi) long. It joins Lake Entrance, which measures approximately 900 m (2,953 ft) wide by 2.2 km (1.4 mi) at the Swansea bridges. The bridges can lift to allow yachts and other larger pleasure craft into and out of the lake. There is no point on the coast from which the entire expanse of the lake and its 174 km (108 mi) foreshore may be seen. However, a good view can be obtained from lookouts in the nearby Watagan Mountains. The remnant and fragmented eucalypt forests on the southern margins of the lake have been identified by BirdLife International as a 121 km2 Important Bird Area (IBA) because they support significant numbers of endangered swift parrots and regent honeyeaters in years when the swamp mahoganies and other favoured trees are flowering. Masked owls and ospreys regularly nest within the IBA. The Pulbah Island Nature Reserve is a protected 68-hectare (168-acre) nature reserve that is located in the southern part of the lake. Being approximately 1.6 kilometres (1 mi) long the island is, by far, the largest island in Lake Macquarie. Pulbah Island is managed by the NSW National Parks & Wildlife Service. There are no permanent structures on the island and it is uninhabited although in the past a maintenance cottage existed on the island. Pulbah is an Australian indigenous Awabakal word meaning "island". Weed infestation on the island is problematic. Local efforts have been made to remove and control weeds species such as Bitou bush, Lantana and Wandering Jew. It also has native trees such as spotted gum. Kangaroos and koalas were introduced to the island during the early 1900s, but they have been extirpated by illegal hunting. Goannas are common on the island. From the island there are clear views of the Wangi Wangi peninsula as well as the Eraring, Munmorah and Vales Point power stations. The island has cliff faces on the west and south sides as well as the south east side. The rest of the island is edged by sandy beaches although the density of vegetation ensures that there is minimal beach at high tide. The east side of the island has a slight bay that is commonly frequented by leisure boats. Camping on the island is not permitted. Bushwalking and picnicking are permitted. Pulbah Island is also a sacred site in Aboriginal culture for the Awabakal people and was declared an Aboriginal place in 1982. In 1983, the State Pollution Control Commission undertook an investigation into the causes of poor water quality in the lake. The final report of this investigation, known as "The Environmental Audit of Lake Macquarie", identified the primary causes of concern, highlighting the major problems of sedimentation and nutrient enrichment. Accelerated sedimentation levels were estimated at 75,000 tonnes (73,815 long tons) per annum and nutrient levels had shown a substantial increase as a result of urbanisation. A study prepared for Lake Macquarie City Council in 1995 estimated that sediment loads to Lake Macquarie were 57,000 t (56,100 long tons) per annum, which was very different to the sediment loads prior to European development, estimated at 6,600 t (6,496 long tons) per annum. Two creek systems, Cockle and Dora Creeks, were estimated to be contributing 23,900 t (23,523 long tons) and 11,000 t (10,826 long tons) per annum respectively. In 1998, the then NSW Premier, Bob Carr, announced the formation of a task force under the chairmanship of Clean Up Australia founder, Ian Kiernan. The report of the task force, known as the "Integrated Estuary and Catchment Management Framework" was accepted by the NSW State Cabinet in February 1999. The report recommended a unique institutional arrangement for implementation through the creation of the Office of the Lake Macquarie and Catchment Coordinator. This cooperative-based arrangement was a joint initiative of Lake Macquarie City Council, Wyong Shire Council, and the NSW Government, with major funding provided by these partners. To oversee the implementation process, a committee known as the Lake Macquarie Project Management Committee was appointed by the then Minister of Land and Water Conservation. The Committee would consist of representatives of both councils; community; regional directors of relevant government departments and three ex-officio members. The action plan, known as the Lake Macquarie Improvement Plan has an emphasis on integration, both physically and administratively, as well as promoting a whole of government approach and strong community involvement. The physical works concentrated on treating the cause of the water problems in the lake by tackling stormwater runoff within the catchment. Again, the emphasis adopted included the use of soft engineering and the restoration of natural ecological processes where possible. After six years in operation, the Lake Macquarie Project Management Committee entered its third project phase in 2006. A series of water quality indicators are used to monitor and quantify the water quality improvements observed by the community. The lake body generally has low nutrient concentrations, good water clarity and excellent dissolved oxygen levels. Activities that reduce the amount of sediments and nutrients washing into the Lake via stormwater run-off have assisted in improving water quality in Lake Macquarie. These activities include the construction of wetlands, the installation of stormwater treatment devices, bush regeneration and an increased awareness by the local community. Recreational fishing is improving as fish stocks respond to the recent removal of commercial fishing and the significant increase in water quality that has come from a concerted environmental program undertaken by the state government and council. Since settlement lake-bed silt has increased in some areas due to unsealed roads, road shoulders and diffuse effects of urbanisation, however the quantity is far less than in nearby Lake Munmorah, and swimming is quite tolerable. Average water depth is approximately 8 m (26 ft) reaching a maximum depth of approximately 15 m (49 ft) east of Pulbah Island. ^ Roy, P. S; Williams, R. J; Jones, A. R; Yassini, I; et al. (2001). "Structure and Function of South-east Australian Estuaries". Estuarine, Coastal and Shelf Science. 53: 351–384. doi:10.1006/ecss.2001.0796. ^ a b "Awaba Lake". Geographical Names Register (GNR) of NSW. Geographical Names Board of New South Wales. Retrieved 19 June 2008. ^ a b c d "Pulbah Island Nature Reserve: Park management". Office of Environment and Heritage. Government of New South Wales. Retrieved 27 September 2014. ^ "Lake Macquarie". Geographical Names Register (GNR) of NSW. Geographical Names Board of New South Wales. Retrieved 19 June 2008. ^ "IBA: Lake Macquarie". Birdata. Birds Australia. Archived from the original on 6 July 2011. Retrieved 29 July 2011. ^ "Important Bird Areas factsheet: Lake Macquarie". BirdLife International. 29 July 2011. ^ "Pulbah Island". Geographical Names Register (GNR) of NSW. Geographical Names Board of New South Wales. Retrieved 25 August 2010. ^ "Pulbah Island Nature Reserve". Geographical Names Register (GNR) of NSW. Geographical Names Board of New South Wales. Retrieved 25 August 2010. ^ "History of Pulbah Island". Lake Macquarie City Council. Retrieved 25 July 2014. ^ "Pulbah Island". Environment & Heritage NSW. Retrieved 4 May 2012. ^ Australian Water and Coastal Studies Pty Ltd (November 1995). "Lake Macquarie Estuary Process Study" (PDF). Lake Macquarie City Council. Retrieved 19 June 2008. ^ "Lake Macquarie Integrated Estuary and Catchment Management Framework" (PDF). The Office of the Lake Macquarie & Catchment Coordinator. Retrieved 19 June 2008. ^ "Background". The Office of the Lake Macquarie & Catchment Coordinator. 2006. Retrieved 19 June 2008. ^ Shields, Nick. "Living Lake Macquarie" (PDF). The Office of the Lake Macquarie & Catchment Coordinator. Retrieved 19 June 2008. ^ "Belmont 16 Footers". Belmont 16ft Sailing Club. Retrieved 19 June 2008. ^ "Home page". Lake Macquarie Yacht Club. Retrieved 19 June 2008. ^ "Toronto Amateur Sailing Club Home Page". Retrieved 27 January 2009. "Lake Macquarie & Tuggerah Lakes catchments" (map). Office of Environment and Heritage. Government of New South Wales. "Lake Macquarie State Conservation Area, Pulbah Island Nature Reserve and Moon Island Nature Reserve: Plan of Management" (PDF). NSW National Parks and Wildlife Service (PDF). Government of New South Wales. 21 January 2005. ISBN 1-74122-013-0. This page was last edited on 17 April 2019, at 13:35 (UTC).